Enter the exact details for your project in the “Printing Details” directly below. But if you need help, you can scroll down and fill out the form for product and/or service your project requires. 4 color process inks are Cyan, Magenta, Yellow and Black; they are used when producing full color images. Standard Inks Pantone: Yellow, Orange 21, Warm Red, Red 032, Red PMS 185, Rubine Red, Rhodamine (Pink) Red, Purple, Violet, Blue 072, Reflex Blue, Process (Light) Blue, Green, Brown PMS 483. PMS--Pantone Matching System use the inks listed above to create more specific colors and have been assigned a three or four digit number. Metallic Inks have flakes of metal in the ink. Foil and Emboss require dies be made. Letterheads, Single Part Forms, Note Sheets, Sell Sheets, Brochures, Flyers, Inside pages of Booklets, etc. Business Cards, Buck Slips, Ledger Cards, Sell Sheets, Brochures, Product Lists, Covers of Booklets Etc. 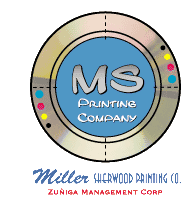 Laser, Inkjet and Diecut Labels are available in many sizes and colors. Please indicate below what are your needs.